Take the butter out of the fridge 15-20 minutes prior to working with it. Place the flour and salt in a large mixing bowl and mix well. Place the butter in with the flour and rub the flour into the butter cubes. Make sure you work in a cool place, you want to avoid the butter from melting. Once the flour is semi-rubbed, start to prepare your water mixture. Mix the lemon juice (vinegar), sugar and water in a jug with a fork until the sugar is dissolved. Sprinkle the lemon/sugar water onto the butter/flour mix and smooth it into the flour using the palms of your hands. Be careful not to overwork the pastry, just smooth it enough to incorporate all ingredients into a dough. Clump the dough together with the smaller pieces off the bowl. Break the dough into two, wrap with cling film and refrigerate for 30 minutes. Sprinkle a generous amount of flour on a bench and place the dough on top. Cover the dough in flour. Initially press down on the dough with the palm of your hand until you get a flat surface, then try to shape it into a long rectangle. Using a rolling pin, roll the dough evenly, lifting it off the surface every now and then to loosen it so that the dough “relaxes” and doesn’t break up as much or rip. From here, you can flour the surface of the dough and freeze in between baking sheets or you can use it straight away. 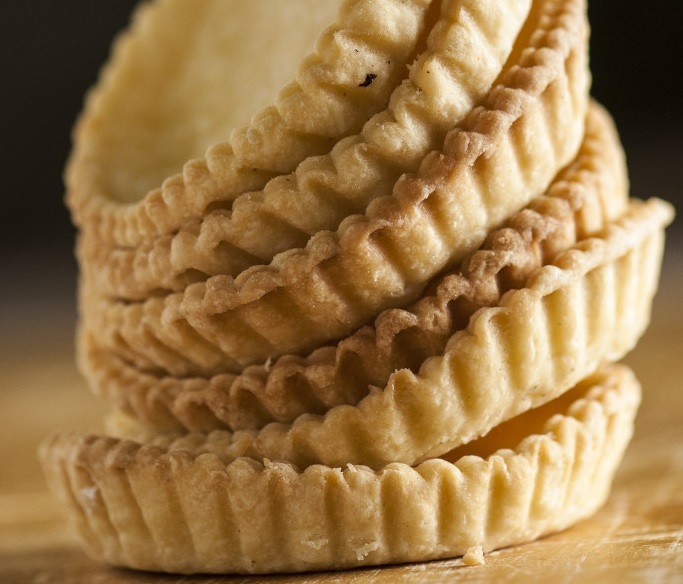 If you are making tart shells, preheat the oven to 180 degrees celsius and cut out discs using 10cm round cutters. Butter the inside of an 8cm tart tin and press the pastry in gently, leaving about 2mm above each tin for shrinkage. Ball up any left over dough and use it to press the edges and corners tighter into the tin. Refrigerate for 10 minutes. Place two pieces of foil down, completely covering the surface of the dough. Place baking beads or dried chick peas in the tart, level to the edges. Bake for 20-25 minutes or until the pastry is golden brown.